The HI-TORQUE is a blend of existing and proven starter engineering, coupled with good old American ingenuity. This combination provides you with not only the most reliable performance starter on the market, but perhaps most important, one that is AFFORDABLE. Solenoid Design - The inherent design of the Lucas solenoid is very susceptible to "Hot Start Syndrome". This is because the windings of the solenoid are encapsulated in steel. The is simply no means for the heat to dissipate. 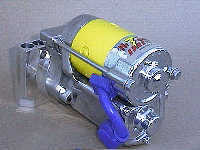 The solenoid for our Hi-Torque starter is encased in aluminum. Inside the area for the solenoid the is the equivalent of 1/2 a cup volume of air. Further, it is equipped with a vent hole. 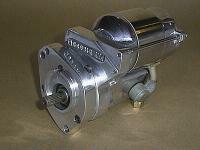 Every time the solenoid is engaged, it pushes(pulls) cooler air into the solenoid area thus virtually eliminating the "Hot Start Syndrome"
Gear Ratio - The gear ratio of the starter is 4.44:1, which enables the starter to develop its unique torque values. Bearings vs Bushings - The Hi-Torque starter is equipped with five (5) full roller bearings while the typical Lucas unit uses two (2) bushings to suspend the armature.